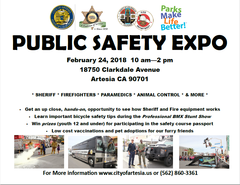 Artesia’s 22nd Annual Public Safety Expo is Saturday, February 24, 2018, from 10:00am to 2:00pm. We will have many of our department bureaus in attendance, including the STAR Unit, SWAT, Arson/Explosives, Helicopter (landing and taking off), Transportation Bus, Posse, Narcotics, K-9, Auto Theft, show cars and more. We will also have members from LASD’s Recruitment Unit, as well as the Los Angeles County Fire Department’s Recruitment Unit in attendance. There will be a BMX stunt show, demonstrations by the Fire Department and Narcotics K-9 Unit. It’s guaranteed to be a great community event, intended for all ages. Come take a picture in our helicopter, Inmate Transportation Bus or with the Bomb Squad Robot… and enjoy a beautiful day in Artesia! We hope to see you there!